I thought that since I posted such a long piece on slavery language in the Bible on Wednesday, I should offer a book on the topic for this week's giveaway. No, it is not one of my books, although I may do a giveaway for one of them in the future. 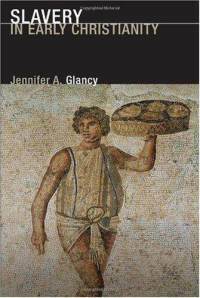 This week's giveaway is Jennifer Glancy's Slavery in Early Christianity (Fortress, 2006). Here's the blurb. This is the first paperback edition of the enlightening Oxford University hardcover published in 2002. Glancy here situates early Christian slavery in its broader cultural setting, arguing that modern scholars have consistently underestimated the pervasive impact of slavery on the institutional structures, ideologies, and practices of the early churches - and upon the bodies of the enslaved. Her careful attention to the bodily experience of subjection and violation that constituted slavery makes this an indispensable book for anyone interested in slavery in early Christianity. Includes special chapters on Jesus and Paul. I highly recommend this book. Although I may not always agree with Glancy's biblical interpretations, I do think she has provided a fine presentation of what slavery was like in the first centuries of Christian history. So put your name below and I will choose a winner on Sunday. Remember, all winners have five days to claim their prize after which time the book goes back on the shelf for another day. heidi denman. . . .
Chris Price - maybe this is my week.